It seems wherever I go, I’m seeing Swiss chard. This showy cool-season plant, so-etimes called a beet without a bottom, is showing up in the landscape, in mixed containers and there it is available in the local grocery store. Is it an ornamental or an edible, you might ask. The answer is both. Then you might wonder, do you eat it fresh or do you cook it? Again, the answer would be both. It has been almost 20 years since the All-American Selections Bright Lights showed up on the scene. There was nothing to not love about this plant that had multicolored stems that were so ornamental looking yet provided that glorious glossy foliage that became a fresh spinach substitute. Swiss chard is known botanically as Beta vulgaris ssp. vulgaris, showing it is indeed a leafy beet. Holy cow, now you look at a catalogue and you’ll see Bright Lights there but also single colors like Oriole, El Dorado, Magenta Sunset, Ruby Red, and the bi-colored Peppermint. The same thing can be found at your grocer. You will probably have three to four varieties to choose from for your culinary artistry in the kitchen. 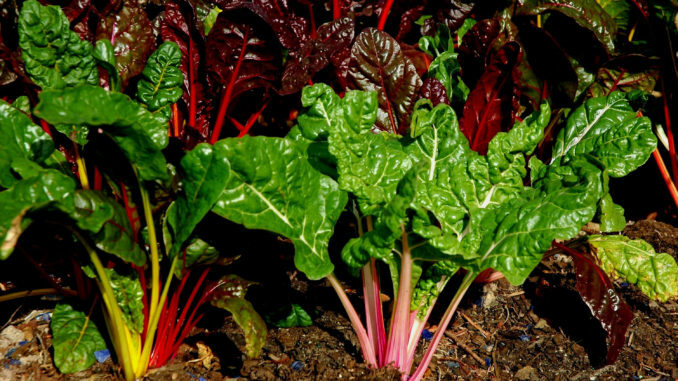 Swiss chard is ready to harvest baby green within 30 days or a mature harvest in 60. Cut or break off the outer leaves when they are 12 to 18 inches tall. You may cut them when they are smaller and more tender. Like many plants, it seems production is lengthened by harvesting. The stalks can be cooked like asparagus. Cut the stems into two- or three-inch lengths and simmer in boiling salted water until tender. The leaves can be cooked or eaten fresh in tossed salads. You may be thinking, perish the thought, you simply want the texture and color in the landscape or designer-styled container. To read more pick up a copy of the December 2018 NTFR issue. To subscribe call 940-872-5922.